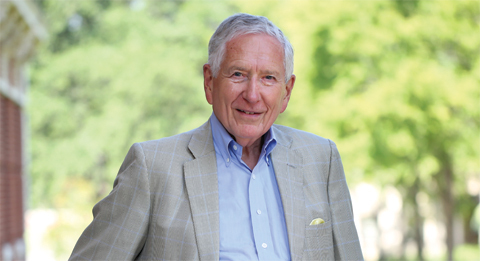 Aside from a few Baylor presidents and a handful of highly regarded professors, few individuals are as inextricably linked to Baylor University as Drayton McLane. A devoted alumnus and longtime Regent, the Temple, Texas, resident's time in the Baylor family has inspired him to undergird and transform the Baylor experience for generations of students and alumni, both past and present. His love for Baylor began as a teenager in nearby Cameron, Texas, when McLane developed a love for Baylor's athletics teams. "Being a Baptist and with Baylor 60 miles away, and knowing many people who had gone to Baylor, including my sister, Kate, I instantly identified with the Baylor football program, and particularly with the basketball and baseball programs," he says. "This was in the '50s when these teams had a lot of success, and I went to a number of Baylor games." Later, as a Baylor student, McLane says he learned a great deal just by living in Brooks and Martin halls. Coming from a small town environment, Waco and Baylor made quite the impression on him. "I came to Baylor in '54, and it was just a big experience for me. It felt like I had come to New York City, it really did," says McLane. "Friends I met were from all over Texas and the United States. I emulated many I admired and learned from them." Long renowned for his business acumen, McLane didn't always plan on taking that career path. "When I came to Baylor I was going to study history. I've always loved history, and I thought I would be a professor. But the second semester of my freshman year I changed my major from history to business. "Those business school professors took a personal interest in me, and that meant a lot. They helped shape me, and I think that's one of the things I didn't realize they were doing," he says. "Being a Christian institution of higher education, they were teaching me integrity, values that later in life, as I experienced business and life in general, I realized I had learned a great deal of value as I attended Baylor." And the rest, as they say, is history. McLane was a perfect fit in the world of business. He earned a master's degree at Michigan State University before joining McLane Wholesale Grocery Business Co., the family business that was founded by his grandfather in 1895. He quickly moved into management and, in 1978, replaced his father as president and CEO of the $176 million enterprise. Through visionary leadership and strategic entrepreneurship, McLane grew the business into a $7 billion enterprise by introducing computer-based technology and adding 18 distribution facilities. In 1991, McLane and shareholders sold the company to family friend Sam Walton for 10.4 million shares of Wal-Mart stock and $50 million in cash. He remained with the companies, serving in executive positions until 1993, when he founded The McLane Group, a holding company for his other enterprises. During this time, McLane bought the Houston Astros. Under his leadership, the Astros won five division titles, built a new stadium, and played in the team's first and only World Series. In 2011, McLane sold the team to another Houston businessman, Jim Crane. First inspired by former President Herbert Reynolds, McLane has made a habit of giving back to Baylor. It was the fond memory of a sweet, sweet sound from his student days that became the impetus for McLane's first major gift. "I was just having a casual conversation with [former development officer] June Gilbreath, [BA '59,] and I mentioned one of the things I got excited about as a student was the carillon in Pat Neff Hall," he says. "You looked forward to the carillon going off -- that meant class was over! "And then I remember, late in the day and at night, the carillon played religious music, and having had great Christian parents and a great Christian experience as I grew up, to hear a religious tune at night when I was studying or walking across the campus meant a lot to me." When McLane was informed that those bells had fallen into silent disrepair for nearly a decade, it struck a chord. "Baylor was trying to raise some money for the carillon, and I got to thinking about it, talked to my family, and I called June back. She told me what they wanted to spend, and I said 'I think we'll give that.'" After that initial gift in 1988, many others followed. Some supported endowed scholarships that transformed the lives of individuals who could not have had the Baylor experience any other way; others were for the McLane Organ in Jones Concert Hall, athletics, and Truett Seminary. One sizable gift helped to fund a hub of daily campus life for thousands of students, the McLane Student Life Center. And the latest contribution from McLane is certainly Texas-sized: the lead gift for Baylor Stadium, the largest donation in Baylor's history. "We gave the gift for the naming right, and we wanted it to always be known as Baylor Stadium," says McLane, who now serves as Regent Emeritus after having served as a Baylor Trustee/Regent from 1988-2006, as well as Chairman of the Board from 2004-06. "I think it's going to transform Baylor, Baylor athletics and Baylor football, particularly." McLane has received the Herbert H. Reynolds Award for Exemplary Service, the W.R. White Service Award and the Baylor Alumni Association Distinguished Alumni Award. McLane and his wife, Elizabeth, are members of the 1845 Society, the Judge R.E.B. Baylor Society within The Medallion Fellowship, the Endowed Scholarship Society, the Athletic Director's Club, the Bear Foundation, the Fast Break Club, Friends of Truett Society and the Tip-Off Club. They have served on several other Baylor boards and committees, most recently on The President's Scholarship Initiative Steering Committee. Through the McLanes' legacy, the Baylor torch burns brightly. Both of the McLanes' children, (Robert) Drayton, BBA '96, and (Richard) Denton, BBA '99, are Baylor alums, as well as McLane's sister, Kate Dimmitt, BBA '56, his niece, Katie Garrison, BSEd '85, and his great-niece, Martha Garrison, a Baylor senior. Though Baylor is just one of many benefactors of the fruits of his labor, Drayton McLane's decades of devotion to Baylor are evident nearly anywhere you look (or listen) on our thriving campus. Yet, McLane holds that Baylor, as good as she is today, can and will become even better at fulfilling its sacred mission. "I love to try to help," he says. "I call it finding the future; you've got to find the future. One of the arts of leadership is to see not only where you are today and what you need to do immediately, but what needs to happen in the long term. "Of course the most important thing for Baylor, as the largest Christian university in America, is higher Christian education. To be a university where a degree earned here is truly meaningful -- it teaches young people how to prepare for the future where they can be successful in their careers, and then they can be successful as mature Christian adults to make contributions to other people's lives." Because of McLane's transformational leadership, Baylor will accomplish its mission tomorrow even better than it does today.